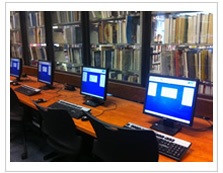 The computer lab at the Library is located on the 2nd floor and has 20 pc stations for patron use. The lab is set up with a reservation system so if you are not a card holder you will need to obtain a Guest Pass at the 2nd Floor desk. A form of picture identification will be required. You must have a Alpena County George N. Fletcher library card, or guest pass, to make a reservation. Each patron is allowed 120 minutes of computer use each day. Computer time is available until 15 minutes prior to closing. The Library has installed time-out software that tracks computer use and allows reservations. To email from the Library, you must use a personal email account which is web-based. Several sites offer free email accounts. The Library provides paper and a networked printer, and charges 20 cents for printing. You may use your own paper but will still be charged 20 cents. The policy does not permit downloading software, installing software or saving files to the hard drive. You may save your files to a USB flash drive. We do accept credit cards however a patron must spend a minimum of $5.00 in order to use it.